How do I create a Contribution button or link? On your Merchant Dashboard, the Button Generator provides step-by-step instructions for creating a Contribution button or link. Goto the Button Generator (beta). 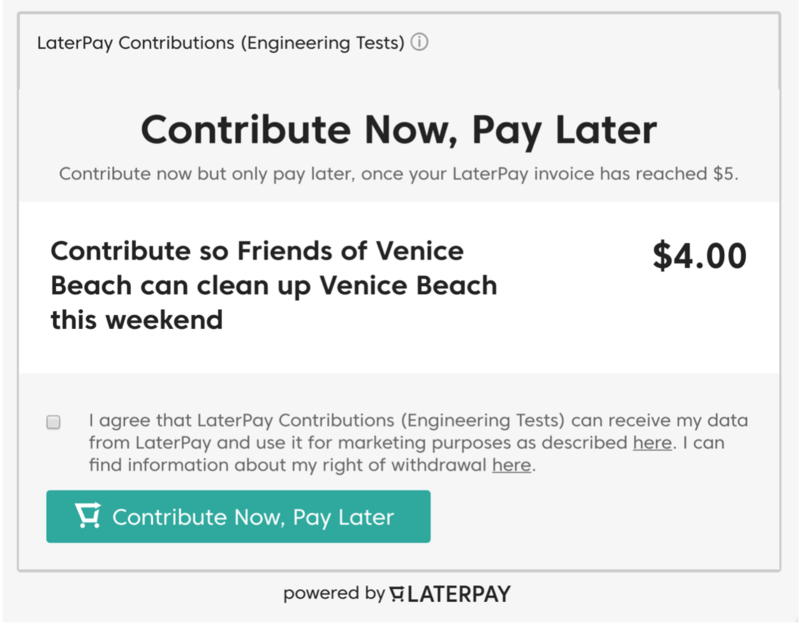 Please note: The statement you enter will appear as the item description in the LaterPay dialog, which appears next to the amount you want people to contribute. Next, decide if you want the Contribution to be Pay Now or Pay Later. Our research shows people are four times more likely to contribute if they can Pay Later. These types of contributions are limited to between five cents and five dollars. So if you’re asking for donations that total more than $5.00, set up the Contribution as a Pay Now Contribution. Next enter your preferred URL: this is usually the page that your user was on before they clicked the Contribution button.